Our horses were already saddled and waiting for us when we arrived at the ranch around 10:00 a.m. We both noticed that they had the hard and unforgiving saddles on them. We made a mental note to pick up some heavy duty bike shorts. I was assigned to a tall, narrow bay gelding by the name of Wildfire and Jill was mounted upon a narrow bay mare named Evangeline. 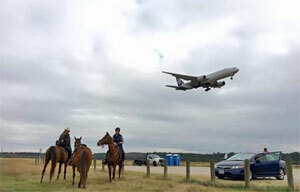 We immediately became aware that we were mounted upon a much different type of horse than the day before. Although their trots were still bouncy, they had wonderful floating canters that were only interrupted by the occasional spook. We were scheduled to ride between 20 and 25 mile today. Darolyn was riding a jumpy Grulla Arab mare. This mare took every chance she could to side step a fence when the angle changed, a patch of sand appeared out of the grass or if Darolyn turned around to provide Jill and I with instruction. Wildfire was living up to his name and was enjoying jumping from here to there, but for some reason I was able to keep my seat. The Sharon Saare I was riding in today was much narrower and shorter than Comrade’s saddle. Actually, I was impressed how secure I did feel even though the leather was hardened and shined to look like (and feel like) chrome. I have 12,000 endurance miles, My Donnie has 5,945 endurance miles, and yet the Fire Mountain 50 held on January 16th, 2016 was the most profound ride in my time together with my horse. For those who don't know, 2015 was a very bad year for Judy and me. The whole story is ten pages long, but the short version is that we unknowingly fed our horses hay for over a year that contained a toxic weed called common groundsel. On May 9th, 2015, it killed our new 8 year old mare, Spice, and made the rest of the herd very sick. We were about a week from losing Wabi, but he made a miraculous recovery due to the 6 months of medications we administered to him and the rest of the horses, including Donnie. The rest of the herd survived, including Warpaint, Wabi, Color, and of course Donnie. Donnie was less affected than the others, but it gave me the scare of my life as the toxic poison worked through his system. Thanks to medicine, and UC Davis, he made it and has recovered. I put him back to work on November first, and his first endurance ride back would be the fire mountain ride. 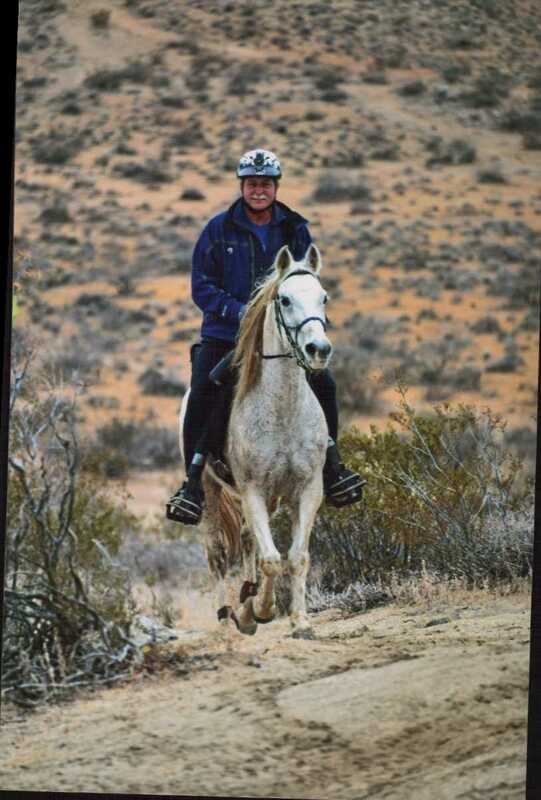 The ride is held in down the So Cal desert in Ridgecrest, and is hosted by the Valley Riders horse club. Last year and this year the ride was managed by my good buddy Gretchen Montgomery, who lives there in the winter, and in Bridgeport in the summer. I rode one day at the ride in January 2015, which made Donnie and me a decade team. He did two more rides until April, when the hay disaster struck, and I could not ride him for 7 months, assuming he survived. (Man, that's still so hard to say) The ride camp is a couple of blocks from Gretchen's house, so she graciously gave me a room for the 4 nights, and built a pipe fence pen for my horse in her yard. I never even went in my camper! It was like doing an endurance ride from a hotel. Thanks G! I slept in the Montgomery hotel again, and at 5:30 am led my horse over to the start. It was a perfect day in the desert so far- cold in the morning, about 37 degrees, overcast, but most importantly, no wind. Wind in the dez can make you want to tear your hair out. The start was moved from 6:30 to 6:45 since it was too dark to see the ribbons. Good call! Peggy and I rode out of camp in the middle/end of the pack, I believe 34 horses started the 50 on day one. Donnie was his old self- walking nicely from the start, with me just smiling. I did a lot of that on this day. Once we hit the trail, we started trotting along on the first loop, the green loop, about 15 miles in length. It starts out climbing to the west up over the hills just south of town, and is the only rocky area on the ride. We walked the climbs and downhills for a couple of miles, but the trail dumps out into the big wash that leads out in to the desert. No deep sand problems today- the rain had ended that threat. The sand sections were that nice, brown, perfect footing that you only get in the wet desert. Nice! The trail heads back up over the range to the South, to the first water and hay stop, and then dumps out into the open desert for a few great miles of trotting. Unlike the 20 mule team trail, where you cover great expanses of the desert and really go places, this ride does loops that stay close to town. We make the turn north and head back over the range, down the graffiti canyon, (why do idiots do that to the desert?) and ride on nice trails back to camp for a 30 minute hold. Donnie led the whole way, happy and strong. He felt so good I knew he was doing okay. I know him and how he feels, and he felt really, really good. His vet check confirmed it- all A's, and CRI of 44/44. Works for me. After the quick 30 minute break where he ate like mad, we headed back out onto the orange loop, the best loop in the ride. It heads up back over the ridge, but sticks to nice trails all the way. No rocks, no steep climbs, just really neat desert single track trails. Lots and lots of UN-interrupted trotting takes us back south a few miles, then a gentle turn loops back towards the ridge, and then back down to camp on the second best trail in the ride. It starts on the ridge and winds down, all over the place, winding through the giant rocks up there (rocks the size of houses and cars, no pads needed!) twisting, rolling, just a special treat that finally heads down the long valley back to camp. Donnie led the whole way, moving along at my favorite quick pace. I showed off a little to Peggy, as I am known to do on occasion when it comes to my horse. Using my legs I release him and he jumps into a screaming, flying, big, really fast trot, just flying. She says “whoa, wait for me!” Then I call him back into his little 3MPH trot that looks like a dressage horse. He just goes how fast I ask. Then I let him go back to his working trot. So nice. I'll shut up now. Two loops down, 30 miles complete, and our second vet check. Same result as the first. He made me smile when he did his normal hour hold routine; he eats for 45 minutes, then falls asleep for 15. The weather was so good- I was riding in a short sleeve tee shirt, but sitting around in camp you needed a light jacket. I cleaned him up, treated him to a fresh saddle pad and girth, and gave him his e-lytes. Peggy and I rode out of camp on the pink loop, 20 miles that lead through the flats and rolling hills. We had been making pretty good time; we left for the last 20 miles at about 1:15. I keep mentioning how nice the weather was- off comes the light jacket after starting to trot. Donnie leaves camp at a brisk trot, with the exact same energy he had at the start. He would run flat out if I asked him to do so. The trail heads out of town to the east towards the bustling metropolis of Trona. Its nice roads and soft desert tails for a few miles, just about all trotable, which we happily did. After the first water stop, (just past the abandoned recliner, (why do idiots do this to the desert?) about a third of the way in, we come to the best trail in the ride. Its the furthest part of the loop from camp- we make a right turn on a perfect, flat, soft single track trail that twists through the desert. It just winds along, up and down slight rises, for a couple of miles that ends way too soon. We slowed down a bit for a trip through a slightly rocky section, but once clear of that its back to the desert floor and the second water stop. We let the boys eat the hay that Mike and I had spread out so carefully at each water stop the day before. Now its a cross country trail for a couple of miles back to the west heading for camp. The trail had been used by bikes and had some whoops in it, but most were avoidable by scooting off to the edge of the trail, or riding in the desert next to the trail. We could see camp coming up as we entered town for the final mile or so to the finish. We crossed the line at about 4pm, with both horses happy. We let them eat for a bit before vetting out, but I knew that Donnie was all good. I could feel it in him during our ride on thursday, I knew it all day, and I knew it now. He was perfect in every way. All A's again, and CRI of 48/48. Big, happy trot for the vet, right to the hay to eat. He ate like a fiend at the trailer, and I suggested to Peggy we go back out and do that orange loop again. She looked at me kind of funny! I would have done it! I certainly had plenty of horse. My ride was a total success, and was made even more sweet due to the fact that 4 months ago I was worried I might lose this horse. That would not have been an option. I spent 6 months doing everything possible to not have him die, and here we are, finishing a ride with him perfect. As tough as we had it last year, sometimes things work out like they are supposed to. In this case it did- I still have my Donnie, and with any luck he and I can do rides for another 10 years. Special thanks to Gretchen and Mike for putting me up in their hotel, to Peggy for a really fun ride, to Gretchen again and the Valley Riders for hosting a great ride that I'd recommend to anyone. Most of all, special thanks to my horse, who made it through our disaster, and lives to enjoy more rides as long as he can and wants to. Next stop- 20 mule team in February!